The Chatsworth exposed thermostatic bar valve with chrome rigid riser kit is part of our traditional collection of bathroom products. Classic styling with a chrome finish and constructed from solid brass, the Chatsworth bar valve has two cross-head tap head controls with classic white indices, one controls the flow and the other controls the temperature. Featuring the latest anti-scald technology, the valve is pre-set to a safe and optimal 38°C, this can be easily offset by holding down the safety push and click button on the handle. The Chatsworth traditional luxury chrome rigid riser kit features a traditional design which integrates seamlessly into any classic or traditional styled bathroom. Comes with a built-in diverter so you can switch between the fixed head or hand held shower. 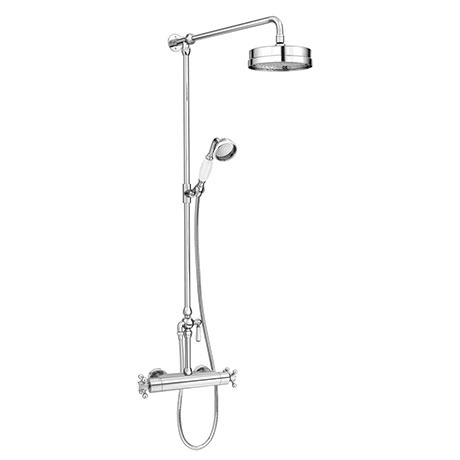 For total flexibility, complete the look of your bathroom with a designer rigid riser shower kit. All kits comprise of exposed pipe work including a sliding rail, shower hose and shower head.